Adrian was born in nearby Chipata 60 years ago and has lived most of his life in the Luangwa Valley. With an intimate knowlege of the area he has some understanding of the complex issues that surround community, conservation and wildlife. He is the son of the late Norman carr, a well known and respected conservationist. he has travelled and worked widely in wildlife areas throughout Africa and has chose Luangwa as his home. Carol is a Certified Financial Planner, and a partner in the firm of Foord, Van Bruggen, Ebersole, and Pajak Financial Services in Sacramento, California and has been a consultant to business and professional clients for over 26 years. She has co-authored three financial books and is in the process of publishing another one about the plight of the African Elephant. She is on the board of Capital Public Radio, (a National Public Radio affiliate) and serves as treasurer. Carol is on the advisory board for the Endowment program of the Cheetah Conservation Society, She has served on numerous boards over the years and first travelled to Africa in 2001 returning to Zambia twice a year for over 14 years to support numerous projects throughout the country. Edward was born and brought up in the beautiful county of Dorset on England’s south coast. From a young age, the outdoors formed a large part of his life, and observing nature on walks with the family dogs was a enjoyable part of a routine day. As did so many, Edward loved Attenborough’s documentaries, admiring the genius of the man and yearning for the stunning locations that he explored. But it was the wildlife of Africa - and particularly the varied and interesting habitats of the bush – that most captured his imagination. Imagining that jobs in Africa were for Africans, he pursued a normal life, taking A-levels, a degree (in Economics of all things!) and then starting work in the city. After beginning a corporate job and quitting soon after due to a mis-match of expectations, Edward took a year off to fill time until he started a second graduate training program. This year extended considerably, and he has now been living in Luangwa since 2009! Starting out as a management assistant at a well-known camp, he spent 5 years learning the tourism and hospitality industry, qualifying as a both a driving and walking guide and building a following for his passion – leading photographic safaris. He has since set up and now runs his own small safari business offering photographic safaris to clients from across the world. His specialist areas are photography, birds, large mammal behaviour and walking safaris. His wife and 2-year-old daughter live with him in the bush. Steve and Anna Tolan have a seat on the CSL Board representing Chipembele Wildlife Education Trust. They are the Founding Directors of Chipembele Wildlife Education Trust, a conservation education NGO established in 1998 for the youth and community of South Luangwa. Before emigrating to Zambia they were both long serving Police Officers in the UK but in their private lives wild Africa was their passion. They travelled extensively across Eastern and Southern Africa before choosing Zambia to settle in. They have devoted their lives lives to conserving the wildlife and natural environment of South Luangwa and to helping the communities that live alongside the Park. Steve is a Senior Honorary Wildlife Police Officer for the area. He is also passionate about the fossils and assists paleontologists around the world in their research and helps co-ordinate expeditions within Zambia. In addition Steve and Anna run a small animal rehabilitation facility, with the aim of reintroducing all rescued animals back to the wild. Nick arrived in the Luangwa Valley in the early 1990's and, as a resident of the area, was involved in tourism and wildlife conservation for over 10 years. In 2002 he and his wife moved to Lusaka where they still reside, in 2009 he established a successful destination management company called Zambian Ground Handlers which co-ordinates trips throughout Zambia for tourists from around the world. Nick first became involved in SLCS whilst living in the Luangwa but since moving to Lusaka he plays more of a role in the administrative support that the society requires in town. Jake held the position of CSL Chairman for many years and recently stood down, but remains a board member and staunch supporter of the organization. He obtained a degree in ecology before coming out to Zambia in the mid 80's to work in the wildlife and tourism industry. Jake founded Flatdogs Camp and helped to set up RATZ which subsequently became SLCS. Jake spent many years living and working in Luangwa Valley and now resides in Lusaka with his family. Nathalie Boulle has been an active participant in wildlife conservation and management related initiatives worldwide and is currently a member of several advisory groups for BirdLife International. She spends a considerable period of time each year in the South Luangwa National Park and is involved with several conservation and community support initiatives in the region. Nathalie has been recognized for her contributions and achievements in the field of conservation through the award of the BirdLife President’s Medal. Dave was born and bred in Zimbabwe and has always had a strong affinity for the bush, spending many hours immersed in the boyhood pursuits of hunting and fishing. After finishing school and doing a gap year in Central America, he completed a BSc (Hons) in Wildlife and Agribusiness from the University of KwaZulu Natal, South Africa. After university, he attended the Royal Military Academy, Sandhurst and commissioned as a British Army officer served as an Infantry Officer in both the Parachute and Duke of Wellington’s Regiment. He resigned his commission as a Captain in 2006, his desire to return to Africa called and it was time to return home and finally work in the industry about which he has always been so passionate. The Luangwa Valley in Zambia had always held a huge appeal for him since being told about it as a boy; stories about the beauty of the place, the teeming wildlife and the fact that it was still very much undiscovered. When the opportunity presented itself, he jumped at the prospect of finally working in the Valley and experiencing it for himself. He is currently the Managing Director of Norman Carr Safaris based at Kapani’s main camp with his wife Kate and their two daughters. Luckily he still manages to find time to pursue his passion for the bush; he has a Grade 1 Professional Walking Guides License for the South Luangwa and he is an Honorary Ranger, appointed by the Zambian Wildlife Authority to help conserve this unique part of Africa. Derek was born in Zambia and comes from a prominent Mkushi farming family with a strong background in wildlife conservation. He runs two camps in South Luangwa National Park and spends approximately half of the year in the Valley and the other half in Lusaka with his family. Chris is a confirmed Africaphile having first visited Zambia as a teenager in the early 1980s. A weekend visit to South Luangwa National Park proved to be life changing and Chris came back to work at one of the safari camps between leaving school and going to university in the hope of getting Africa out of his system. It didn't work. He came back to Luangwa after university and spent the best part of two years running camps and guiding safaris before returning to the UK and, after a stint work for a travel agency in London, setting up Wildlife Worldwide in 1992 - a specialist tour operator. Wildlife Worldwide, based in Winchester, England, is now one of the worlds leading wildlife travel companies and is part of a wider group of travel businesses (that Chris also established) called The Natural Travel Collection which includes Dive Worldwide and Schools Worldwide. Chris is a committed conservationist who travels the world to find the best wildlife areas, lodges and guides to promote to Wildlife Worldwide clients and he regularly returns to Zambia and Luangwa with clients. Mtimba Zulu has worked in the Hospitality industry for over a decade. He has a certificate in Purchasing and Supply from Chartered Institute of Purchasing and Supply, a Diploma in Store Management, a Bachelor’s Degree in Business Administration, a Post graduate Certificate in Business Administration, and a Master’s in Business Administration. 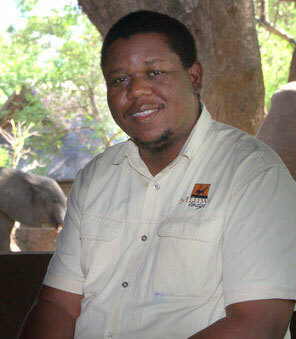 He currently works as the Operations Manager at Mfuwe Lodge in South Luangwa National Park. He loves what he does. Conservation is his lifestyle. He is also a Honorary Wildlife Police Officer, with the Department of National Parks and Wildlife. He is also an entrepreneur, running a number of businesses. Evans Graph is a Zambian native, born in November 1978 in Chipata. In 2002, he came to Mfuwe originally as a teacher. When Chipembele Wildlife Education Trust started conservation clubs in schools he was one of the first patrons and it was from here that his love for conservation started and continued to develop. He has participated and led several projects in conservation ranging from tree planting to anti-snaring campaigns.